A BlackBerry shareholder has filed a class action lawsuit against the company, basically accusing it of painting a much rosier picture of the company’s future, including how awesome and great sales of the new BlackBerry 10 smartphone lines would be. The reality has been far less delightful for the struggling smartphone makers. The lawsuit seeks class action status for thousands of shareholders who bought stock between Sept. 27, 2012 and Sept. 20, 2013, reports the Associated Press. 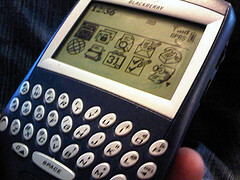 During that time, the suit claims executives misled investors about the state of BlackBerry’s operations. According to the lawsuit, BlackBerry shouldn’t have said that it was “progressing on its financial and operational commitments,” and that developers were over the moon about the new BlackBerry 10 platform. “In reality, the BlackBerry 10 was not well received by the market, and the company was forced to… lay off approximately 4,500 employees, totaling approximately 40 percent of its total workforce,” the complaint alleges. Last month the company revealed about a billion dollars in losses, attributed mostly an excess of unsold BlackbBerry Z10 smartphones.